You'd think after seven visits I'd start getting tired of going to the same restaurant but LudoBites always manages to entice me back. Something about the whole pop-up structure makes it feel like each incarnation is a new experience. 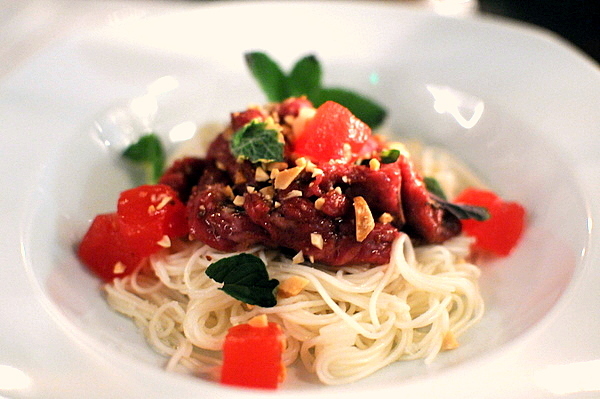 It doesn't hurt that Ludo uses the time between restaurants to drastically reinvent the menu. Thus here we are, back again at LudoBites 5.0 or is it LudoBites 4.5 considering the fact that the last version closed less than two months ago and was in the exact same location. Ultimately it is the completely revamped menu that makes this an entirely separate beast from the fourth incarnation. With each new opening Ludo's popularity grows with leaps and bounds. Last time I couldn't even book a seat for the first day, this time around I couldn't even get on the system. The sheer volume of people trying to get in brought the reservation system to a screeching halt. Fortunately I was able to bum a seat from a friend's table. I wasn't sure what to expect with this wine but I got a pronounced minerality complimented by a floral character on the nose. Light fruit and fresh acidity follow on the palate, with the sweetness becoming more apparent as the wine cools. 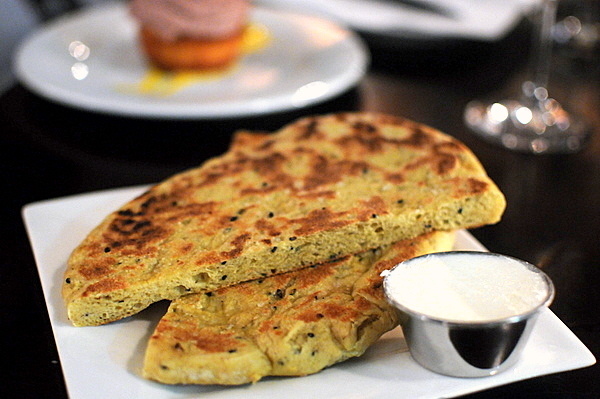 Vadouvan is one of Chef's favorite spices though he plays it safe here pairing it with his rendition of a Naan bread. The combination is delightfully savory with a slight curry essence on the finish. With the addition of the butter, the dish takes on a decidedly sweeter shade, reminding me of a waffle with syrup. 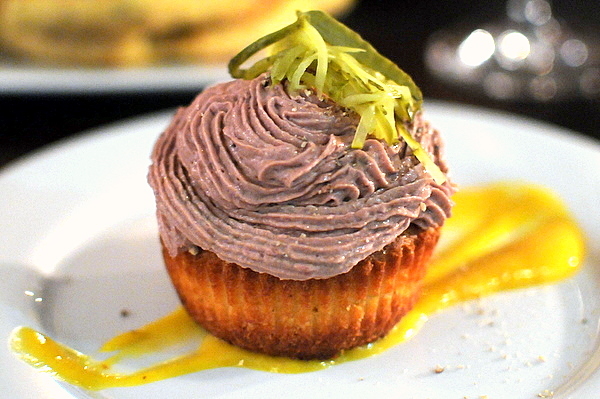 The chicken liver and ham were a match made in heaven, smoky and sapid, perfect when paired with the simple cheesy zest of the cupcake itself. The kumquats and cornichons were instrumental in cutting the weight of the preceding elements though I felt the citrus lingered on the palate overlong, drawing attention away from the core of the dish. I was expecting the wagyu beef to dominate this dish but the meat was more for textural contrast, adding a slick muscular chewiness. In fact it was the somen and peanut that came to the fore reminding me of cold Chinese noodles with peanut sauce. Quite enjoyable and unexpected, just what I've come to expect from Ludo. 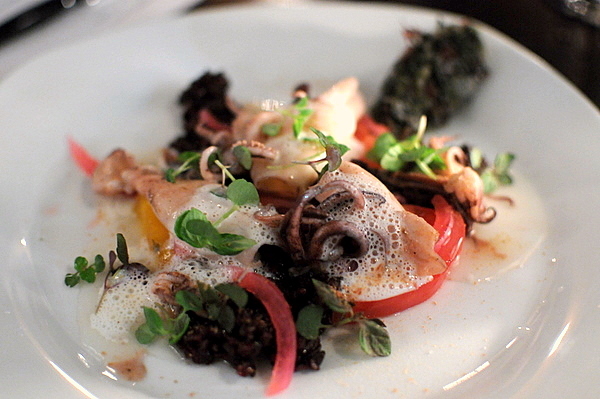 Squid has been a highlight every time it is featured on the menu and this was no different. 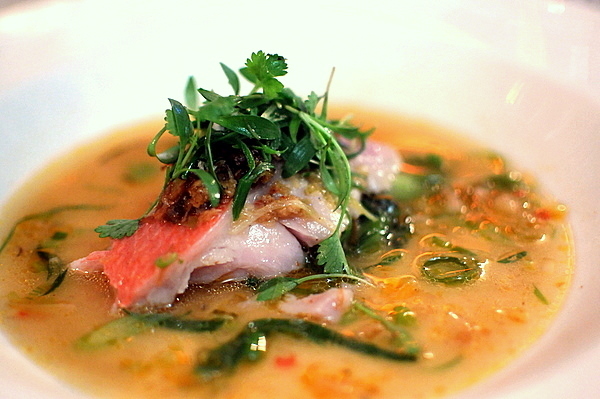 The essence of the squid is enhanced by the umami broth but it is the accents that make this special. The fresh bite of the tomato, to the slight citrus tang of the onions and the subtle finish of mint on the palate serve to elevate this dish from expertly prepared squid to an absolutely sublime experience. Ludo is justifiably lauded for his soups and tasting this it is easy to see why. The base itself is a creamy goat cheese which pairs nicely with the apple and amazingly the tofu as well. 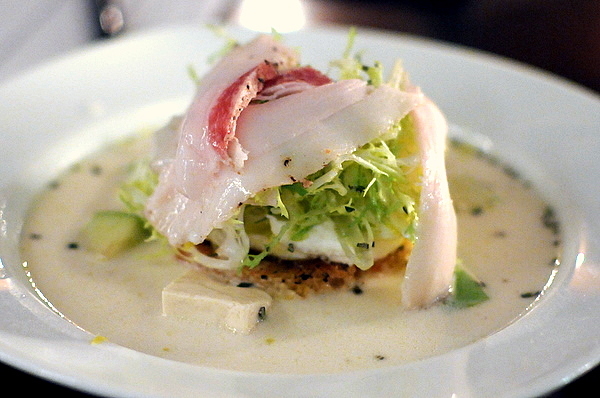 If that wasn't enough, the dish also contains core elements of a Lyonnaise salad (lardons and frisée) which also compliment the gamy broth and have a satisfying salty/sweet interplay with the apple. If anything there was so much going on with this soup that it was hard to fully appreciate any single element. The octopus was perhaps the most direct course of the night and one of the few where I enjoyed the prime ingredient best on its own. The tentacle had a satisfying meatiness and remarkable tenderness. After the meal Ludo came by and explained he simply cooked the octopus for 3-4 hours rather than relying on fancy techniques to tenderize it. 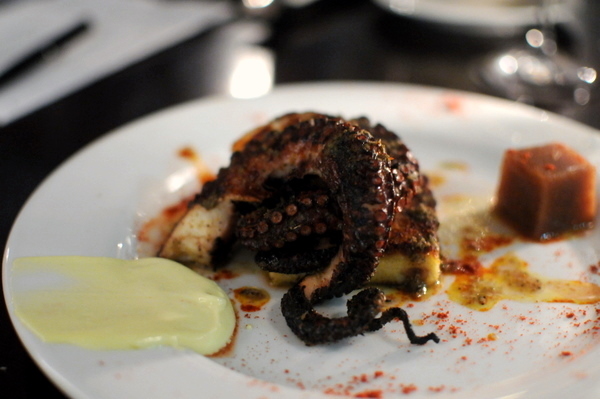 The natural smokiness of the octopus was complimented by a zesty Cajon seasoning that added a lovely peppery tinge. Though this course doesn't look like much, it was one of the table favorites. The egg itself is well integrated into the potato adding a slick silky texture to balance the graininess of the mousseline. The prawns are balanced at the hairy edge between raw and cooked. While the added flavor of the chorizo gives the dish an approachable ham/egg/potato complexion yet leaves room to appreciate the sweetness of the prawns. 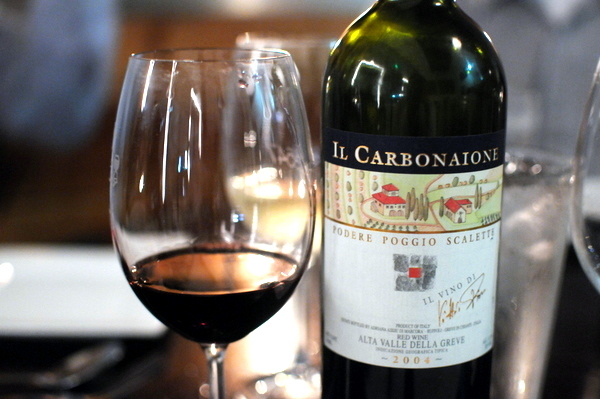 Our second wine was a Tuscan red made up of 100% Sangiovese. I noticed aromas of white flowers and ripe dark fruits with a core of tannins that felt a bit imposing. I suspect a couple more years would do wonders for this bottle. 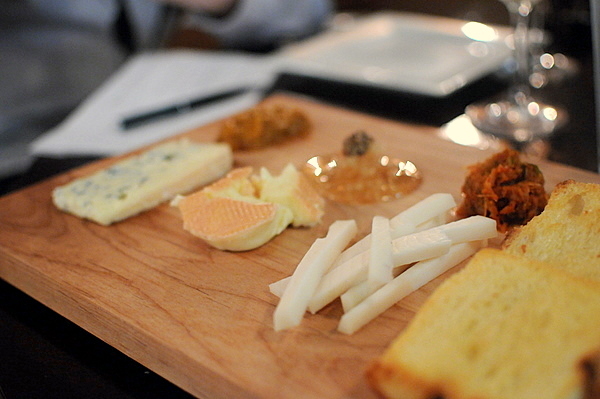 The cheese plate was presented as the final appetizer which is a nice change of pace from the typical presentation right before dessert. Goat Gouda with Pear Kimchi Chutney: A mild approachable cheese on its own, the Gouda paired nicely with the Chutney which started with a slight sweetness before exploding in a burst of spice. Gras Des Vosges (Cow) with Whole Grain Mustard, Honey Comb: This was my favorite of the three, gooey and delightfully salty but not overly pungent, the cheese went nicely with the sugary honey comb. 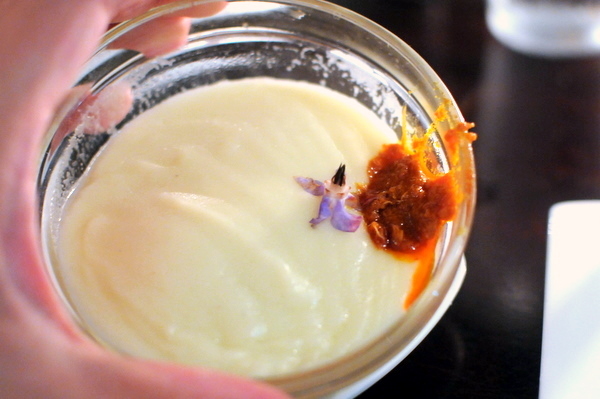 Bleu des Causses (Cow) with Apricots-Lavender: This was what I term a beginners bleu, the characteristic sharpness of blue cheese was evident but not overwhelming while the apricots and lavender added a distinct herbal shading which I felt did not suit the cheese. Previously Ludo vowed never to do a cheese cart saying it was too boring. After dinner Ludo came by and we asked what changed his mind and he told us it was in response to numerous repeated demands for a cheese cart. It was nice to see that Ludo's growing success hasn't gone to his head and that he can still listen to his patrons... sometimes. The cod was an excellent choice to pair with the uni, flaky and dense with enough natural flavor to stand up to the urchin's striking brine. 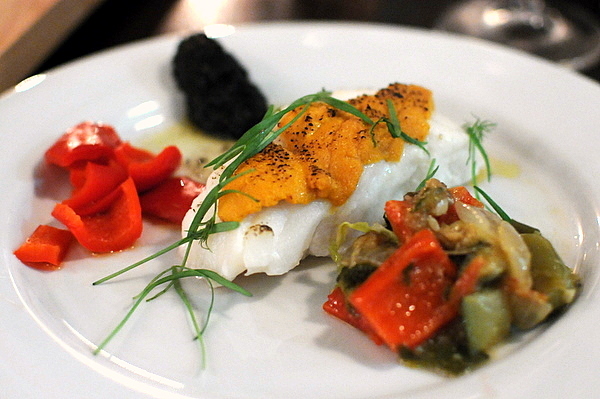 I particularly enjoyed the contrast between the fresh bell pepper pickles and the sweeter cooked version in the ratatouille, both of which contrasted with the fish nicely. The only knock against this dish would be the overwhelming pungency of the "black curry" which I suspect was a derivative of black bean paste. Taken in small quantities this added a earthy bitter cast to the dish, but in large quantities I could taste little else but the curry. This was my first experience with steamed duck and I certainly hope not my last. The flavor was surprisingly reminiscent of a roast duck but the texture is noticeably more succulent due to the greater moisture during the cooking process. The crispy skin puree felt like a cross between typical duck skin and a breaded coating giving the bird a nice crunch to boot. Pork belly is always a strong note to end on. 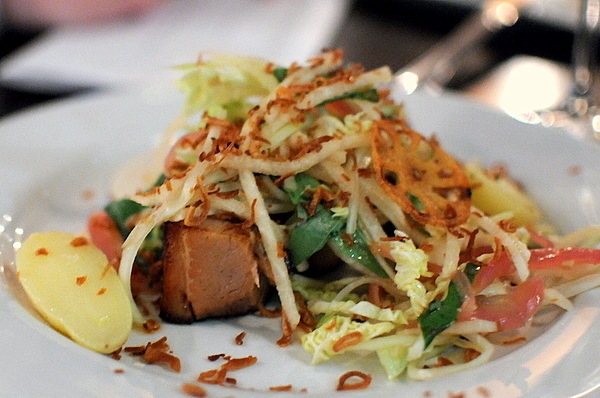 It goes without saying the belly itself was delicious, but it was the Thai-style slaw that made this dish. The sweet tang was the perfect foil to the belly, cutting right through the fat and keeping the dish from being to heavy. I was hoping for a salted caramel or butterscotch flavor from the caramel and fleur de sel combination but the bitter grapefruit the other two components from meshing completely and the resultant mix was more like an eggy pound cake with fruit. I didn't know what to expect when I saw this on the menu. Seems sacrilegious tainting a treasured childhood dessert with vegetables. 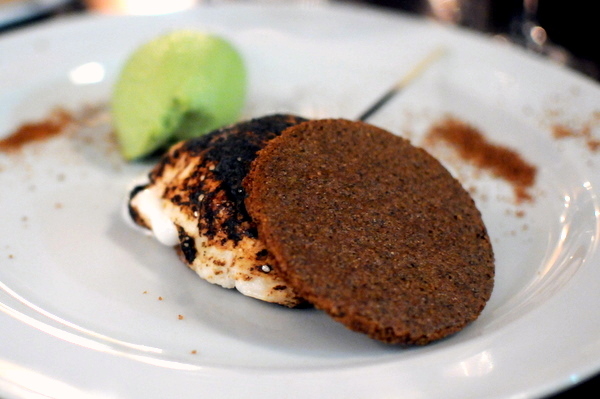 The S'More had a distinctly alcoholic tinge resulting in a bitter finish behind the sugary sweet marshmallow. I typically love unique ice creams and anything avocado but the guacamole sorbet resulted in a vegetal flavor and incredibly dense body the just felt disconcerting, especially when paired with the S'More. Apparently these last two months were time well spent, culminating in the strongest Ludo dinner ever. As mentioned earlier the menu has been completely revamped, though I'd expect no less from Ludo. Furthermore the food seems even more refined this time around, resulting in elaborately crafted dishes that combine disparate elements from multiple cultures into a delicious cohesive whole. I missed out on the foie gras with Chinese BBQ sauce, satisfying my curiosity for this course alone is worth a return trip, assuming I can actually get reservations. I tend to shy away from restaurants that bill themselves as "lounges" believing that they are more about the atmosphere than the food. Still I should have paid more attention to Sashi, based on the pedigree of its Executive Chef, Mokoto Okuwa. 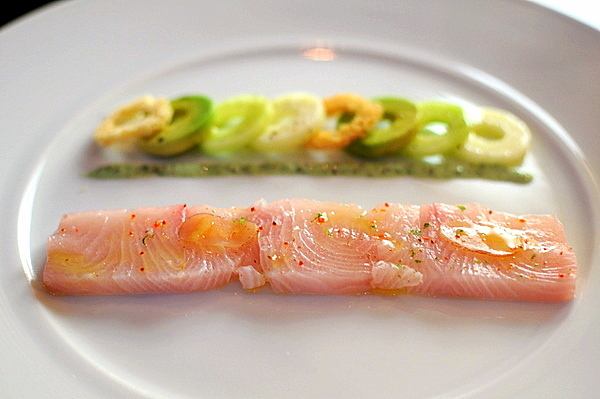 Chef Okuwa got his start in Japan at the tender age of 15 apprenticed to Sushi Chef Makoto Kumazaki. Afterward he spent six years with Chef Masaharu Morimoto, learning to blend his classical Japanese training with worldwide influences. He even was one of Chef Morimoto's assistants on Iron Chef. This evening we were here to celebrate Chef Okuwa's turn on the other side of the competition. 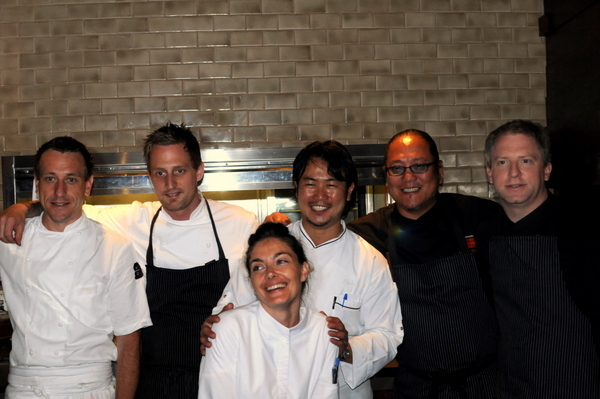 Joining him were five other chefs: his mentor, Masaharu Morimoto, Michael Voltaggio currently of The Dining Room, Noriyuki Sugie of Ironnori (though we might know him better for his work at Hatchi), Sonny Sweetman of Wolfgang Puck, and Waylynn Lucas of Patina. The event began at 5:00 with sake, beer and cocktails as well as 5 canapes with the actual dinner beginning at 7:00 and a showing of Chef Okuwa's Iron Chef battle to conclude the evening. Below is a list of the four Hors'dourves I tried. Unfortunately, I showed up around 6:00 and was unable to sample the savory macrons of Chef Sweetman. 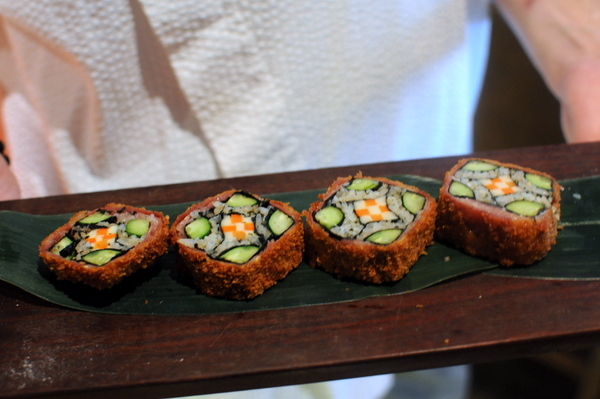 The man of the hour provided an intricately patterned maki that at first glance appeared to be vegetarian. Upon closer inspection I saw the layer of Prosciutto sandwiched between the crispy exterior and the roll itself. 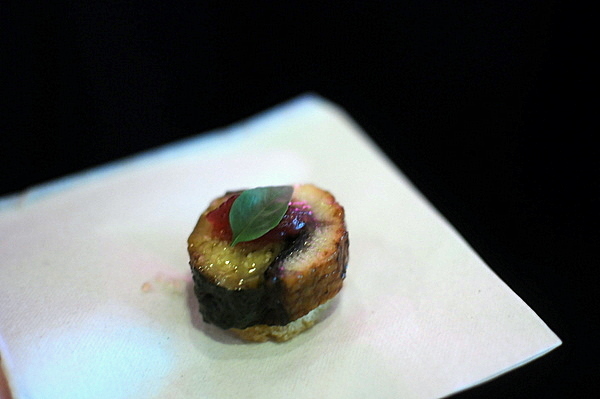 Next up was an intricately wrapped onigiri provided by Noiyuki Sugie "Chief Gastronomy Officer" for BreadBar's Hatchi. 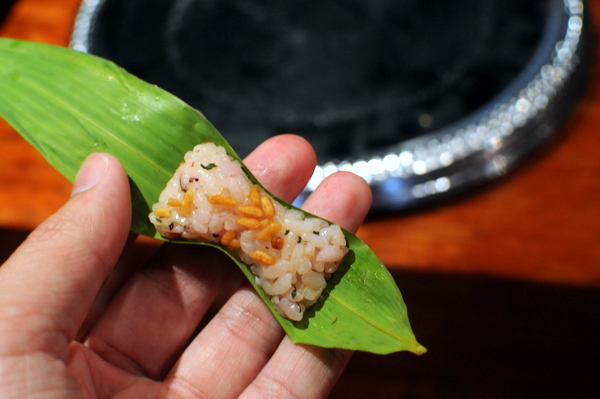 The rice opens with a distinctly nutty attack courtesy of the bamboo and releases a subtly sweet tang from the umi upon mastication that adds a bit ov levity to the sticky rice. 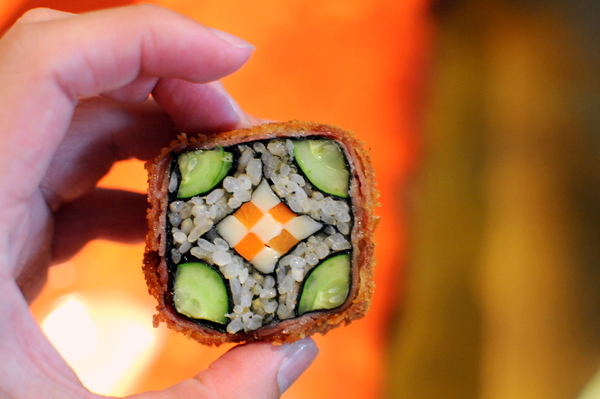 Humble and enjoyable, just what onigiri was meant to be. I've never cared much for eggplant; hence I was pleasantly surprised by this dish. The Nasu possessed a supple firmness and distinctly smokiness that complimented the eel perfectly, while the single shiso leaf was just enough to give the dish a light herbaceous counterpoint. I could see Chef Voltaggio's style written all over these. Take an obscure and oft-intimidating ingredient and present it in a way that is approachable and delicious. 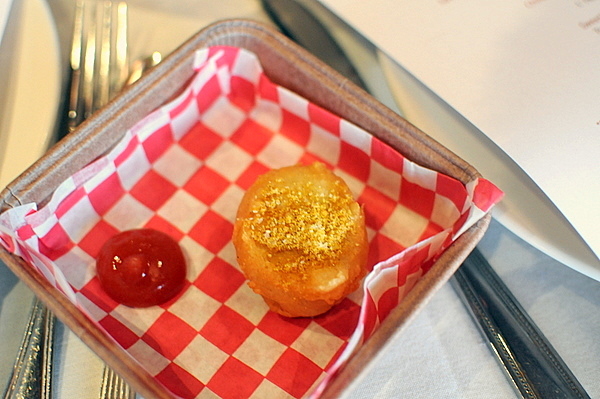 This looked and tasted so much like a classic Chicken McNugget that I would have been hard-pressed to identify the filling as sweetbread had I not already known beforehand. I'm wondering if there was a bit of humor involved in the use of organ meat to make the filling; perhaps a nod to the questionable origins of the dish's namesake. The dinner proper began at 7:00 though it took some time for people to get seated and the first courses weren't served until 7:20. The meal started off strong with a modern presentation of the Jewish American classic bagel with cream cheese and lox. The creamy interplay of the salmon and cheese was punctuated by flavors from the citrus and seaweed that sat atop the cheese which added depth without stealing focus from the core ingredients. Our server described the "salad" as deconstructed but I think Chef Sugie took it a step beyond. Though enjoyable, I found the bacon and cheese elements of the dish overwhelming. To be fair, the other elements of a classic Caesar Salad are lighter in flavor. Still, considering this course was supposed to be a salad, I would have liked the vegetable broth to feature more prominently. Chef Sweetman's lobster salad was a far cry from the cloying mayo slathered lobster fruit salad typical of Chinese banquets. 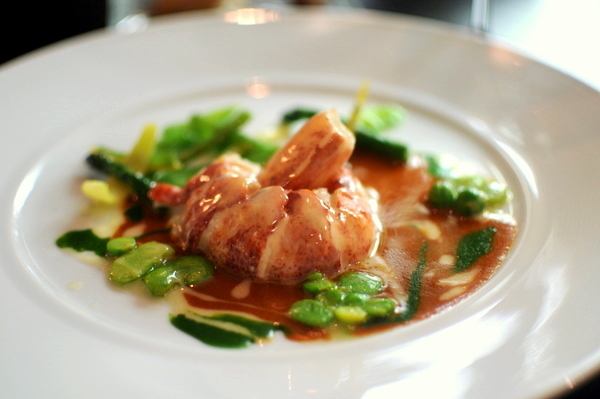 Instead the lobster comes with crisp bitter greens and a saccharine yuzu dressing. The simple yet stark contrast was delicious and a beautiful compliment to the lobster. 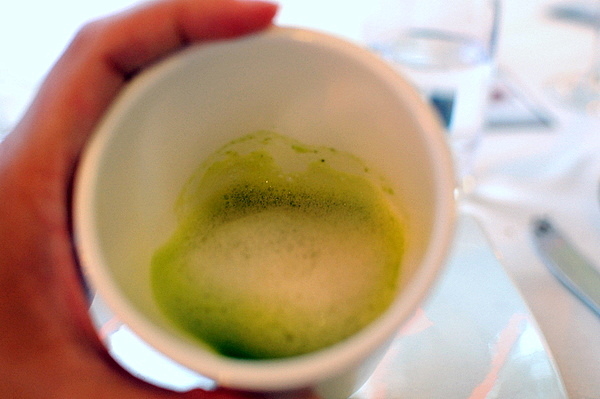 I suspect a fair number of those in attendance came specifically to taste Morimoto's food and he did not disappoint. My companions likened the fish to a Chinese steamed fish and I was inclined to agree at least initially. What set Morimoto's fish apart was the masterful use of the XO sauce, drawing on its heavy umami flavor to accent the fish without overwhelming the delicate essence of the snapper. Meat: Wagyu Beef - "Thai Flavor"
The final savory was a super tender Wagyu beef short rib (I think) prepared by Chef Voltaggio. Beef short rib tends to be heavily marbled and fatty, doubly so with Wagyu beef so I was expecting the Thai flavor to be something of a footnote. 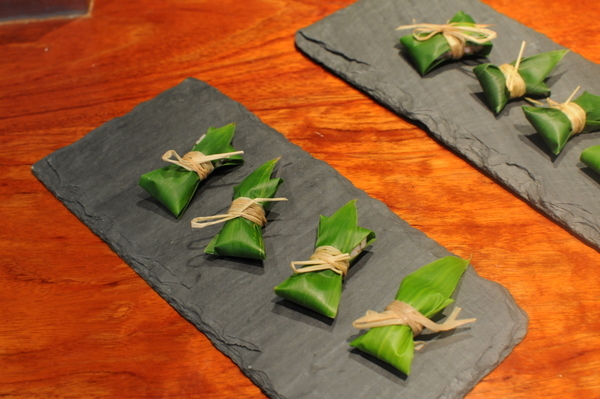 Instead the delicate coconut and curry essences and savory crisped rice came through shockingly clearly. 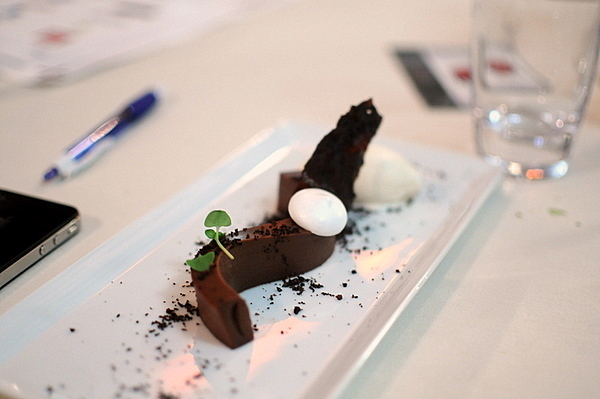 Dessert came courtesy of Chef Waylynn Lucas, and featured a base of chocolate ganache accompanied by a mint meringue and a spectacular eucalyptus ice cream. As with the bagel and cream cheese, it is the multifaceted complexity these accents bring that makes this dessert special. Taken with the meringue, the amalgam is reminiscent of a York Peppermint Patty, while the ice cream adds a completely unique floral sweetness that is unlike anything I can remember. The meal turned out to be quite successful. 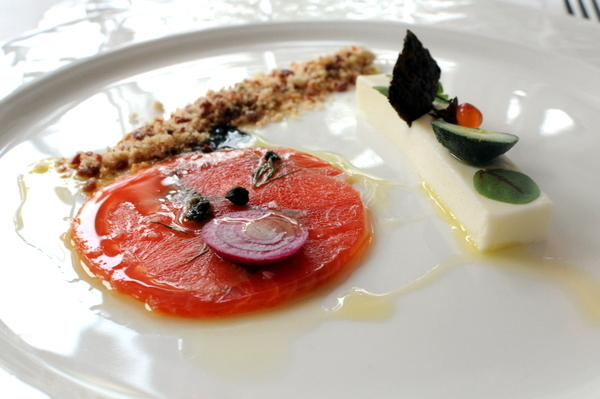 The food was quite elegant highlighting the skills and styles of each of the six chefs. Whats more the service proved to be fairly solid, quite impressive considering the fact that staff had to plate and serve 200 courses simultaneously. The actual showing of the Iron Chef episode was a bit awkward as it was hard to follow the episode while enjoying the dinner. Still based on this experience I think Sashi deserves a return visit to sample some of Chef Okuwa's creative small plates and sushi. 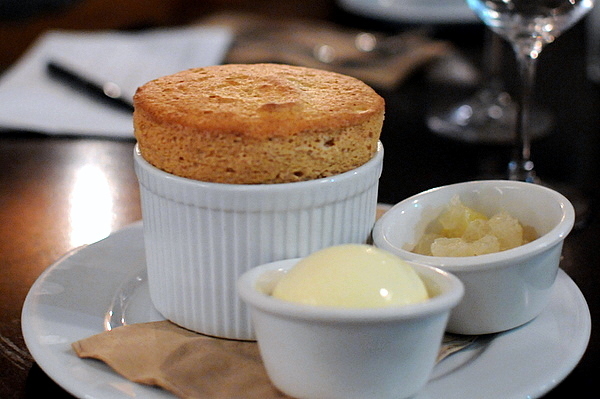 I've had consistently good experiences at The Patina Group restaurants and the flagship Patina was one of the best. This should come as no surprise as the restaurant has long been a fixture on LA's culinary landscape. The restaurant has a laundry list of alumni that any establishment should be proud of. My first visit was three years ago while the restaurant was still under Chef Theo Schoenegger. With his departure for Las Vegas, Chef Tony Esnault was tapped to lead the kitchen. Previously Chef Esnault was Exec Chef at both Alain Ducasse and Adour in New York. 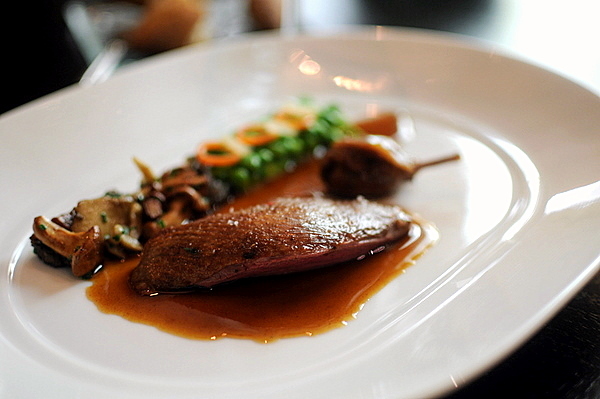 I had the opportunity to try his cooking at Adour and was looking forward to how this meal compared. A fairly simple bread selection. I thought the olive was quite mild, a welcome change from typical olive bread and the seven grain smacked distinctly of Corn Flakes. The meal started off with a bang. 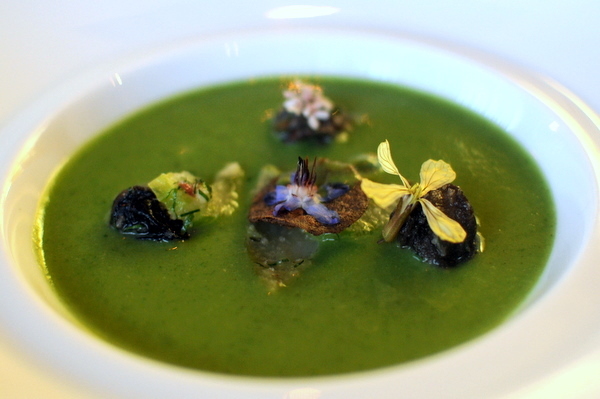 The bold green of the soup aptly reflected its striking herbaceousness. The snails were a fitting compliment to the veritable liquid garden and I appreciated their earthy bite and light garlic sapor. They would have been perfect but for the mouthful of sand I got in my third snail. This looked very similar to one of Chef Esnault's dishes at Adour though I thought the flavors were more balanced this time around. The fish itself was oily and dense but surprisingly light on the palate, needing the geoduck slivers to give the dish a fitting essence of brine. Recently I've been enjoying more bitter pairings with my foie, so it was nice to see a return to more classical accompaniments. I was concerned that the peach would be overly sweet but it proved to be very much in tune with the rich foie and fresh zest of the basil. 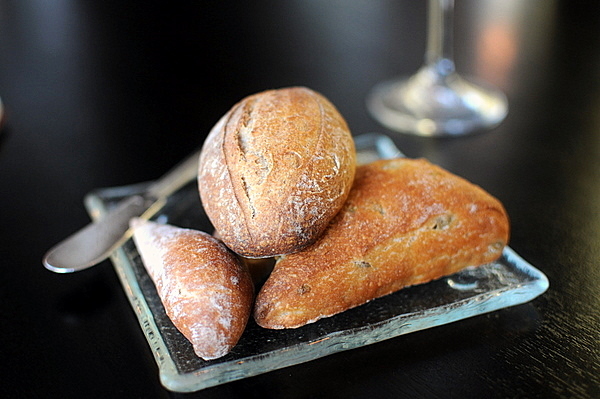 The country bread was the perfect foil to the foie with its rough texture and rustic flavor. 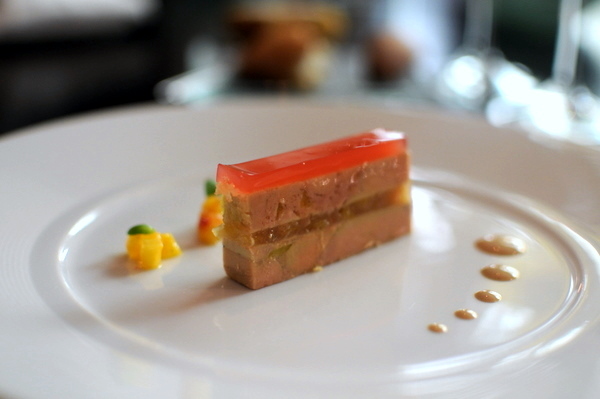 Another holdover from Adour, though the name has improved from the "Glazed Multicolor Vegetable Composition." 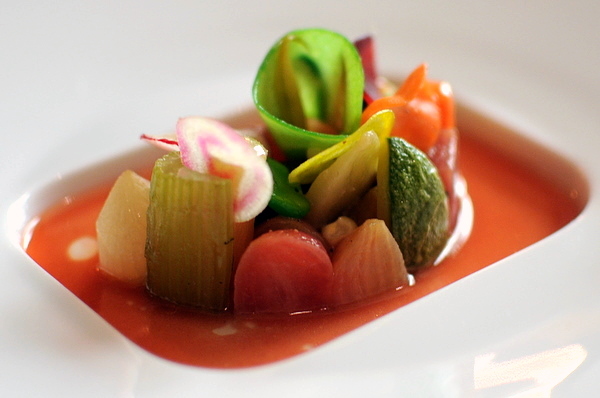 Unlike most other preparations of gargouillou, Chef Esnault's uses cooked vegetables. Though the cooking unifies the vegetables to a degree I was still able to appreciate the riot of flavors and textures. The savory jus gave the dish a stew-like complexion which helped balance the sweetness of the cooked vegetables. 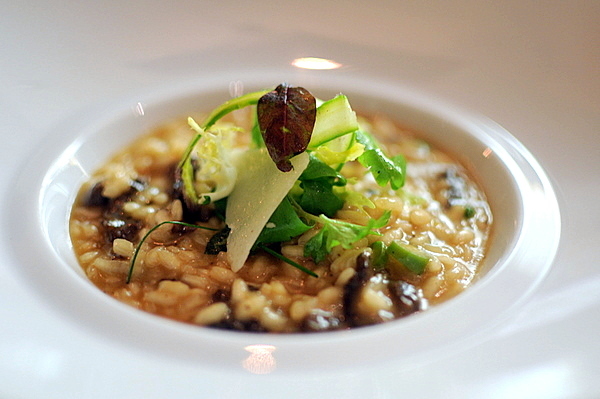 Our first dinner here began one of my friend's love affair with risotto. I don't think there was any way this risotto could have lived up to the memory of that first transcendent experience, but stepping back it was easy to appreciate the charms of this risotto. I especially enjoyed the interplay between the heavy earthy morels and the grassy bitterness of the asparagus. 04: Butter Poached Maine Lobster - Haricots Verts, Sugar Snap Peas, Fava Beans, English Peas, "Jus de la Presse"
The lobster came to the table redolent with the scent of sweet brown butter which complimented but didn't overwhelm the natural flvor of the crustacean. The lobster itself consisted of two layers a dense well-cooked exterior and a snappy rare core. 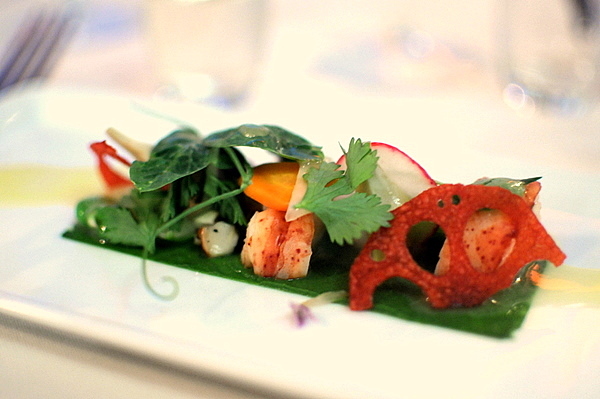 The mixed greens worked exceedingly well, imparting a sweet nuttiness perfectly suited to the richness of the lobster. 05: Dorade Royal "Au Plat" - Fennel, Zucchini, Eggplant, "Riviera Jus"
The beautifully cooked dorade was plated tableside with each diner getting two generous pieces. 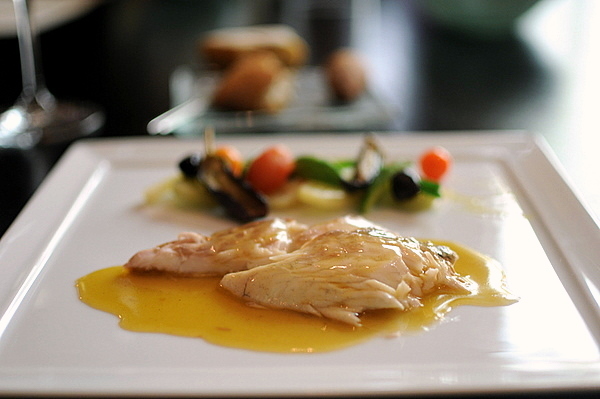 The fish was coated in a light "Riviera Jus" that gave just the right amount of flavor but didn't overwhelm the fish. The vegetables were enjoyable but I preferred the fish on its own. I had a good feeling about this course the instant it was presented. The breast had the perfect amount of firmness and a smoky flesh complimented with a rich flavorful skin. 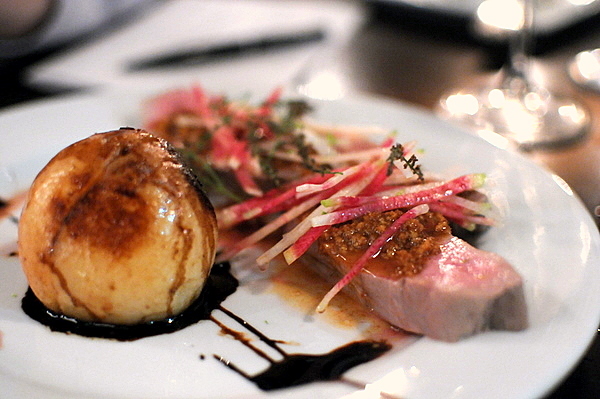 The confit was also particularly noteworthy, succulent and tender with a heavy unctuousness not present in the breast. The bird stood easily on its own, but proved to be equally delicious when eaten with the mushroom and peas. There seemed to be no wrong way to enjoy this course. 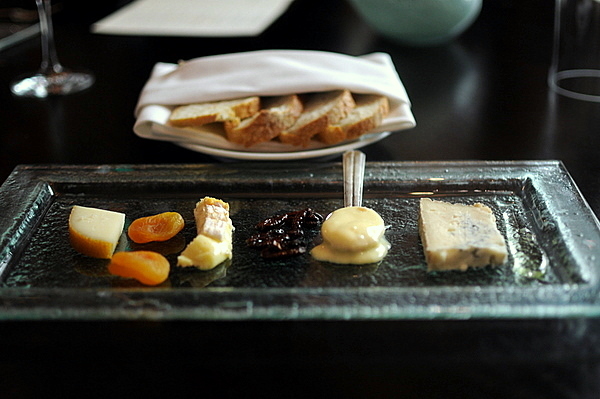 As always we asked our server to pick a selection of cheeses and we were not disappointed. The Etorki was surprisingly good for a hard cheese, nutty and clean with a characteristic cheesy undertone. The Epoisses du Bourgone was another exceptional cheese gooey soft, like a more full-flavored version of my favorite, Brilliat Savarin. 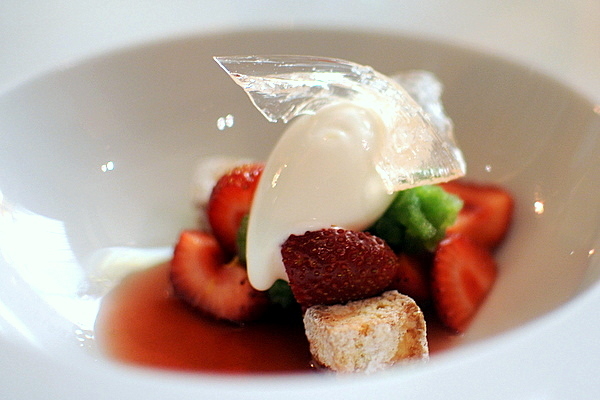 An absolutely gorgeous dessert, the bright tang of the fresh strawberries ties beautifully with the tart creamy sorbet while the vegetal granite adds a refreshing bitter counterpoint to the sweetness of the fruit. 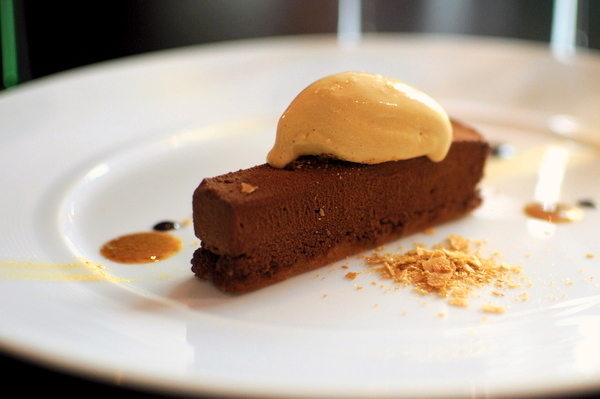 Hard to find fault with this dessert, while not as daring as the Strawberry Composition, the familiar pairing of chocolate and hazelnut is hard to beat. One of my companions likened this to Voltaggio's Fool's Gold while I saw the obvious visual parallels, I felt Richard's Kit Kat Bar was a more apt comparison in terms of flavor and texture. Once again the Patina Group delivers. The style is fairly understated, lacking the glitz of say The Bazaar but the more low-key tempo seems fitting for one of LA's oldest fine dining restaurants. 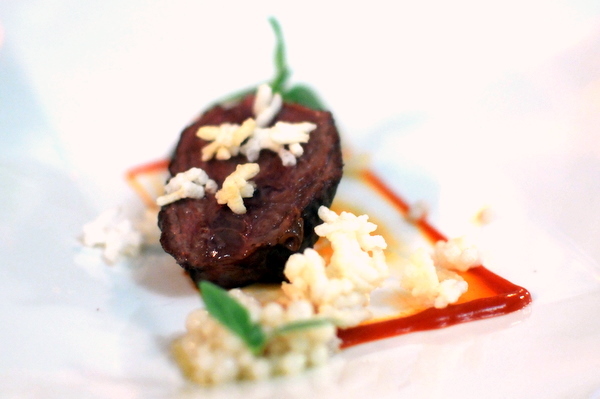 The meal was solid from start to finish with the mosaic, squab, and strawberry composition standing out. It certainly won't be three years before I'm here again.